As late as 1982 Soviet musicologists claiming any significance for Nikolay Roslavets were vigorously suppressed. Only in 1990 was his unmarked grave identified. How many scores were lost when his flat was ransacked just after his death in 1944? The ruthless vengeance of a reactionary proletariat—branding Roslavets, himself born of peasant stock and a fervent 1917 revolutionary, a mere pedlar of bourgeois ‘art for art’s sake’—has fortunately now given way to a gradual recognition of the very real significance of this ‘Russian Schoenberg’. In the hours of the New Moon is an early work, probably dating from Roslavets’s student days at the Moscow Conservatory. Already present is a developed musical awareness, as French Impressionism and the heady orchestral textures of Richard Strauss are subsumed into a Scriabin-esque unity of considerable stature. The Chamber Symphony of 1934/5 (not to be confused with the 1926 fragment of the same name which was reconstructed and recorded in the 1990s, before the manuscript of the present work was discovered) is without doubt Roslavets’s most significant symphonic work. Here recorded for the first time, this major work employs nine solo woodwind, two horns, trumpet, piano, string quartet and double bass to great effect. The closest analogy is perhaps to Schoenberg’s first Chamber Symphony (similarly scored), but alongside elements of conscious homage Roslavets adds his own magical sprinkling of Russian folksong, sardonic worldliness and symphonic jazz. On his appointement in 2003 Ilan Volkov was the youngest-ever Chief Conductor of a BBC orchestra. His recording of works by Janácek (CDA67517) with the BBC Scottish Symphony Orchestra in 2005 caused something of a stir: ‘The gifted young Israeli conductor Ilan Volkov masterminds a laudably disciplined and full-throated account of this bracing rarity … Hyperion’s glowing natural sound-frame (courtesy of the Keener/Eadon production team working within Dundee’s Caird Hall) sets the seal on a first-rate anthology’ (Gramophone). This new recording is their second collaboration for Hyperion. Long forgotten, even actively suppressed, Nikolay Andreyevitch Roslavets has emerged as one of the most fascinating figures in Russian music from the first half of the twentieth century. Unlike most of his contemporaries in the early Soviet period, he genuinely came from a peasant background. In autobiographical jottings dating from 1924 he described his birthplace—Dushatino in the Ukraine, where he first drew breath on 4 January 1881 (Old Style 23 December 1880)—as ‘a godforsaken, half-Ukrainian, half-Byelorussian hole’. At first self-taught, Roslavets began to study music during the 1890s by attending classes in Kursk, the nearest large city, and was eventually accepted as a student at the Moscow Conservatory, where he studied the violin as well as composition under Sergei Vassilenko and Mikhail Ippolitov-Ivanov. He graduated in 1912, gaining the Grand Silver Medal for his cantata Heaven and Earth, inspired by Lord Byron’s poetic drama. Even this early Roslavets was associated, along with Alexander Mosolov and Arthur Lourié, with Russia’s artistic avant-garde. He engaged in the vigorous artistic debates occasioned by Futurism, Symbolism and other new ideas, and was close to visual artists such as Kasimir Malevich. In 1915 and 1916 he had pieces published in Russian Futurist journals: the only music that appeared in them. Roslavets welcomed the revolutions of 1917 and after the Bolshevik Revolution in October he was made director of Kharkov Conservatory, a post he held until 1924 when he returned to Moscow and took up a position in the State Publishing House. Describing himself as ‘extreme left-wing’ and ‘an intellectually creative proletarian’, Roslavets directed its Political Department, edited the journal Muzykalnaya Kultura, and was one of the leaders (with his contemporary and friend Nikolay Myaskovsky) of the most progressive of the various new musical bodies competing for attention in the USSR, the Association for Contemporary Music. His colleagues included Myaskovsky, Mosolov, Popov and Shostakovich. The tenth anniversary of the October Revolution was celebrated in 1927 with a concert featuring the premiere of Roslavets’s cantata October in the same programme as those of Shostakovich’s Second Symphony ‘Dedication to October’, and Mosolov’s Iron Foundry. Nevertheless Roslavets was a committed modernist. The direction of his artistic sympathies is apparent from his support for performances of music by the Second Viennese School and his authorship of articles including one entitled ‘On pseudo-proletarian music’. For several years his works had already been under attack from the adherents of ‘proletarian music’, especially RAPM (the Russian Association of Proletarian Musicians), who claimed them as counter-revolutionary and bourgeois art for art’s sake. The endless political warfare sapped Roslavets’s strength. In 1929 he was denounced as an ‘enemy of the People’ and in 1930 he was forced to publicly repent of his former artistic convictions. He spent some years in Tashkent, Uzbekistan, as musical adviser of the Opera and Ballet Theatre. However he returned to Moscow in 1933 where he lectured at the Polytechnic Institute and was later required to train military-band leaders. He made a living out of this and other comparatively menial tasks until he was finally admitted to the Composers’ Union in 1940. He suffered a severe stroke in the same year and was semi-invalid until his death from a second stroke in 1944. By the early 1920s Roslavets was sometimes being referred to as ‘the Russian Schoenberg’, but in an article published in 1925 the critic Yevgeny Braudo pointed out that this was no more helpful than to call Schoenberg ‘the German Debussy’. Though his music is often highly dissonant, Roslavets’s principles did not encompass twelve-note formulations—except, like late Scriabin, in passing. After his fall from grace, while in Tashkent, he turned for a while to working with folk material, producing among other works the first Uzbek ballet, Pachta (‘Cotton’). The works of his last years in Moscow show a simplification of his characteristic language to admit a more classical conception of tonality, but are still individual in orientation, such as the late cycle of twenty-four Preludes for violin and piano (1941–2). Immediately after his death his flat was ransacked by a group of former ‘proletarian musicians’ who confiscated many manuscripts, though others were saved by his widow. For thirty years afterwards Roslavets’s name, expunged from the music dictionaries, was hardly mentioned in Soviet musical literature, except in derogatory terms. His name reappeared in a Soviet music dictionary in 1978 but scholars who attempted to claim some importance for him were still being attacked in the press as late as 1982. In the wake of perestroika, however, Roslavets was among the creative figures who were substantially rehabilitated. His grave in the Vagankovo Cemetery, which had remained unmarked, was identified in 1990, and many of his compositions have now been revived, published and recorded. 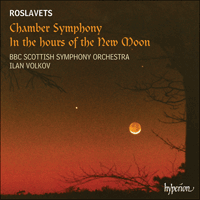 The symphonic poem In the hours of the New Moon (Russian: V chasi novolunya) is one of Roslavets’s earliest surviving works, written (or at least begun) while he was still a student at Moscow Conservatory. (Dates suggested for the work range from 1910 to 1913.) There is no evidence that it was ever performed in the composer’s lifetime, and very little is known about it except what can be deduced from the score itself. It is not even clear if the title is merely descriptive, or a quotation: but it is certainly appropriate for a work which seems to present itself as an ecstatic but perhaps ultimately rather sinister nocturne. The manuscript of the symphonic poem languished for many years in the Central State Archives of the USSR, and is here recorded based on the reconstruction and editing work carried out by Dr Marina Lobanova. Written for a large orchestra, it clearly manifests a number of contemporary influences, above all that of Scriabin, whose Poem of Ecstasy had been premiered in 1908; but also the French Impressionist composers, particularly Debussy and Ravel, and perhaps, too, the heady orchestral textures of Richard Strauss and Franz Schreker. If the latter were not direct influences, they were contemporary parallels—and for another we should remember that In the hours of the New Moon is an exact contemporary of Stravinsky’s ballet The Firebird. The magical, nocturnal, Impressionistic aspects of that work derive much more from Rimsky-Korsakov, of whom there are few traces in Roslavets’s score. In purely Russian terms, therefore, Roslavets here shows himself the more cosmopolitan composer. The work has a clear ternary form, beginning and ending with slow-moving but lustrous Lento music. The initial quiet brass chord, of two perfect fourths separated by a tritone, is the harmonic foundation of the piece. The rustling string figurations, tremulous flutes, rising trumpet-calls (shades of Poem of Ecstasy) are joined by shimmering harp and celesta in a sonic fabric of remarkable delicacy, showing Roslavets’s sure command of a large orchestra. Ostinato figures build to a tumultuous but harmonically static tutti climax, which then dissipates into a languorous episode centred around woodwind solos, especially from the cor anglais. This gives way to an Allegro, soon increasing speed to Presto, which forms a central scherzo-like episode. This is certainly a dance (of elves, moon-sprites or more sinister figures) in a lively 3/8 time—the most Impressionistic music in the work but reminiscent particularly of Debussy’s ballet Jeux (1912), a work Roslavets presumably could not have known. There is a return to the opening Lento material, its various elements heard now in similar but slightly different relationships, rising once again to an overwhelming climax, a varied intensification of the climax in the first section. It is broken off abruptly; the quiet, hushed conclusion unwinds back to the soft brass chord with which the work began. For all the picturesque and free-form aspects of this piece, it has a firm structural basis and indeed much of Roslavets’s output is concerned with his personal treatment of sonata-based genres. In addition to string quartets, piano trios, violin sonatas and so on, Roslavets made a number of attempts on the grandest sonata-style genre of all: the symphony. Apparently an early symphony exists from 1910, and two more were sketched in 1921–2 but not completed. In 1926 he began composing a Chamber Symphony, but left this project (which seems to have been planned in two movements) unfinished, as a single movement in short score, lacking a coda. That highly interesting fragment was completed and orchestrated by the composer Alexander Raskatov (for an ensemble of eighteen players), and was performed and recorded in the 1990s as ‘the Roslavets Chamber Symphony’. However, it was merely the realization of a fascinating abandoned torso. It was not then realized that there existed a complete—and immensely larger—Chamber Symphony by Roslavets, whose manuscript has emerged subsequently. It was not published until 2005, and its first recording now appears on the present disc. Also scored for eighteen players—nine solo woodwind, two horns, trumpet, piano, string quartet and double bass—this major work, undoubtedly Roslavets’s most important symphonic utterance, was composed between May 1934 and February 1935, not long after he had returned to Moscow from Uzbekistan. It is known that he showed it to Myaskovsky (who was impressed), but he was unsuccessful in securing a performance, which was probably out of the question after the notorious Pravda denunciations of Shostakovich in January 1936. Longtemps oublié, voire vivement réprimé, Nicolaï Andreïevitch Roslavetz est apparu comme l’une des figures les plus fascinantes de la musique russe de la première moitié du XXe siècle. Contrairement à la plupart de ses contemporains de la première période soviétique, il était vraiment issu d’un milieu paysan. Dans ses notes autobiographiques (1924), il évoqua son lieu de naissance—Duchatino, en Ukraine, où il naquit le 4 janvier 1881 (23 décembre 1880 vieux style)—en ces termes: «un trou paumé moitié ukrainien, moitié biélorusse». D’abord autodidacte, il commença d’étudier la musique dans les années 1890 en suivant des cours à Koursk, la grande ville la plus proche, avant d’intégrer le Conservatoire de Moscou, où il apprit le violon et la composition sous la direction de Sergueï Vassilenko et de Mikhaïl Ippolitov-Ivanov. Il en sortit diplômé en 1912 et remporta la grande médaille d’argent avec sa cantate Le ciel et la terre, inspirée par le drame poétique de Lord Byron. Déjà lié à l’avant-garde russe, avec Alexandre Mossolov et Arthur Lourié, il prit part aux houleux débats suscités par le futurisme, le symbolisme et d’autres idées nouvelles, et fut proche de plasticiens comme Kasimir Malevitch. En 1915 et en 1916, ses pièces parurent dans les journaux futuristes russes, qui ne publièrent aucune autre musique. Roslavetz salua les révolutions de 1917: après la révolution bolchevique d’Octobre, il fut nommé directeur du Conservatoire de Kharkov, un poste qu’il occupa jusqu’en 1924, date à laquelle il rentra à Moscou pour travailler aux Éditions nationales. Se dépeignant lui-même comme un «prolétaire d’extrême-gauche intellectuellement créatif», il y dirigea le département politique, édita le journal Muzykalnaya Kultura et fut, avec son ami Nicolaï Miaskowski, l’un des chefs de file de l’Association pour la musique contemporaine, le plus progressiste des nouveaux organes musicaux qui se disputaient l’attention en URSS. Miaskowski, Mossolov, Popov et Chostakovitch furent de ses collègues. Le dixième anniversaire de la révolution d’Octobre fut célébré en 1927 par un concert où furent créés la cantate Octobre de Roslavetz, la Symphonie no 2 («dédiée à la révolution d’Octobre») de Chostakovitch et Fonderie d’acier de Mossolov. Roslavetz n’en fut pas moins un moderniste convaincu: le soutien qu’il accorda aux exécutions d’œuvres de la Seconde École viennoise et les articles qu’il rédigea—tel «De la musique pseudo-prolétarienne»—reflètent clairement ses sympathies musicales. Depuis plusieurs années déjà, sa musique était la cible d’attaques lancées par les tenants de la «musique prolétarienne» et surtout par l’ARMP («Association russe des musiciens prolétaires»), qui la disaient contre-révolutionnaire et y voyaient le symbole de l’art pour l’art bourgeois. Ces incessantes luttes politiques sapèrent les forces de Roslavetz. Dénoncé comme «ennemi du peuple» en 1929, il dut se repentir publiquement de ses convictions artistiques (1930) et passa quelques années à Tachkent (Ouzbékistan) comme conseiller musical de l’Opéra et du Théâtre de ballet. Il rentra cependant en 1933 à Moscou, où il enseigna à l’Institut polytechnique—par la suite, on lui demanda de former les chefs de fanfares militaires. Il vécut de ces fonctions et d’autres tâches relativement ingrates avant d’être finalement admis à l’Union des compositeurs, en 1940. Mais cette année-là fut aussi celle d’une grave attaque qui le laissa à demi invalide jusqu’à sa mort, des suites d’une seconde attaque, en 1944. Au début des années 1920, Roslavetz fut parfois surnommé «le Schönberg russe» mais, dans un article publié en 1925, le critique Evgeni Braudo souligna que c’était aussi inutile que d’appeler Schönberg «le Debussy allemand». Les principes de Roslavetz, dont la musique est pourtant souvent fort dissonante, n’incluent pas de formulations dodécaphoniques—ou alors juste en passant, comme chez le Scriabine dernière manière. Après être tombé en disgrâce, et alors qu’il se trouvait à Tachkent, Roslavetz s’intéressa un temps au matériau populaire et produisit notamment le premier ballet ouzbek, Pachta («Coton»). Les œuvres de ses dernières années moscovites montrent une simplification de son langage visant à admettre une conception plus classique de la tonalité, malgré une orientation toute personnelle perceptible dans son cycle tardif de vingt-quatre Préludes pour violon et piano (1941–2). Juste après sa mort, un groupe d’anciens «musiciens prolétaires» saccagea son appartement et confisqua nombre de manuscrits, même si sa veuve put en sauver certains. Pendant trente ans, Roslavetz, expurgé des dictionnaires musicaux, fut à peine mentionné dans la littérature musicale soviétique, sauf pour être dénigré. En 1978, son nom réapparut dans un dictionnaire musical soviétique, mais les spécialistes qui tentèrent de lui redonner de l’importance furent attaqués par la presse jusqu’en 1982. Roslavetz fut cependant l’une des figures créatrices largement réhabilitées après la perestroïka. Sa tombe au cimetière de Vagankovo, qui était restée sans nom, fut identifiée en 1990 et nombre de ses œuvres ont été sauvées de l’oubli, publiées et enregistrées. Le poème symphonique Aux heures de la nouvelle lune (V chasi novolunya en russe) est en réalité l’une des plus anciennes œuvres survivantes de Roslavetz, lequel l’écrivit (ou du moins l’entama) alors qu’il étudiait encore au Conservatoire de Moscou. (Les dates suggérées pour cette œuvre vont de 1910 à 1913.) Rien ne prouve que ce poème symphonique fût jamais joué du vivant de son auteur et le peu que l’on en sait a été déduit de la partition. On ignore même si le titre est purement descriptif ou s’il s’agit d’une citation—une chose est sûre, il convient bien à cette œuvre qui semble se présenter comme un nocturne extatique, mais finalement, peut-être, assez sinistre. Après des années passées à croupir aux Archives nationales centrales de l’URSS, le manuscrit de ce poème symphonique fut édité et terminé par Dr. Marina Lobanova. Écrite pour grand orchestre, cette pièce dévoile l’influence évidente de certains contemporains, à commencer par Scriabine, dont le Poème de l’extase avait été créé en 1908; se font également sentir des compositeurs impressionnistes français, comme Debussy et Ravel, mais aussi, peut-être, les enivrantes textures orchestrales de Richard Strauss et de Franz Schreker qui, s’ils n’exercèrent pas une influence directe, furent contemporains de Roslavetz. N’oublions pas non plus que Aux heures de la nouvelle lune fut l’exact contemporain de L’Oiseau de feu, le ballet de Stravinsky. Mais les aspects magique, nocturne et impressionniste de cette œuvre dérivent bien davantage de Rimski-Korsakov, dont quelques traces émaillent la partition de Roslavetz. En termes purement russes, Roslavetz s’affirme donc ici comme le compositeur le plus cosmopolite. L’œuvre, à l’évidente forme ternaire, s’ouvre et s’achève sur une musique Lento, lente mais chatoyante. Le paisible accord initial aux cuivres, de deux quartes parfaites distantes d’un triton, en constitue le fondement harmonique. Les bruissantes figurations aux cordes, les flûtes frémissantes et les appels de trompette ascendants (fantômes du Poème de l’extase) sont rejoints par une harpe et un célesta miroitants dans un tissu sonore remarquablement délicat, qui prouve combien Roslavetz maîtrisait le grand orchestre. Des figures d’ostinato s’accumulent jusqu’à un apogée (tutti) tumultueux mais harmoniquement statique, qui se dissipe ensuite en un épisode langoureux centré autour de solos confiés aux bois, au cor anglais notamment. S’ensuit un Allegro, le tempo s’accroissant bientôt pour atteindre Presto, qui forme un épisode central de type scherzo. Il s’agit assurément là d’une danse (d’elfes, de lutins lunaires voire de personnages plus sinistres), dans un joyeux 3/8—la musique la plus impressionniste de l’œuvre, qui rappelle tout particulièrement le ballet debussyste Jeux (1912), que Roslavetz n’a, selon toute vraisemblance, pas pu connaître. De retour, le matériau du Lento initial voit ses divers éléments apparaître dans des relations similaires mais légèrement dissemblables, la musique s’élevant de nouveau pour atteindre un irrésistible apogée, intensification variée de celui de la première section. Il est brusquement rompu; la paisible et profonde conclusion se déroule jusqu’au doux accord de cuivres qui avait ouvert l’œuvre. Malgré tous ses aspects pittoresques et libres, cette pièce possède une solide assise structurelle—de fait, dans ses compositions, Roslavetz s’attacha beaucoup à traiter de manière personnelle les genres fondés sur la sonate. Il écrivit des quatuors à cordes, des trios avec piano, des sonates pour violon, etc. mais s’essaya aussi au plus grandiose genre de style sonate: la symphonie. Il existe apparemment une symphonie précoce (1910) et deux symphonies esquissées (1921–2) mais inachevées. En 1926, Roslavetz entreprit de composer une symphonie de chambre, mais le projet (prévu, semble-t-il, en deux mouvements) demeura inachevé, limité à un mouvement unique sous forme de particelle, sans coda. Ce fragment des plus intéressants fut achevé et orchestré par le compositeur Raskatov (pour un ensemble de dix-huit instrumentistes) avant d’être exécuté et enregistré dans les années 1990 sous l’appellation «la Symphonie de chambre de Roslavetz». Toutefois, ce n’était là que la concrétisation d’un fascinant fragment abandonné. Nikolai Andrejewitsch Roslawez, lange vergessen, sogar ausdrücklich unterdrückt, ist als eine der faszinierendsten Gestalten in der russischen Musik aus der ersten Hälfte des 20. Jahrhunderts hervorgetreten. Anders als die meisten seiner Zeitgenossen aus der frühen sowjetischen Periode, stammte er tatsächlich aus dem Bauerntum. In autobiographischen Skizzen von 1924 beschreibt er seinen Geburtsort—Duschatino in der Ukraine, wo er am 4. Januar 1881 (dem 23. Dezember 1880 nach dem alten Kalender) zur Welt kam—als „ein gottverlassenes, halb ukrainisches, halb weissrussisches Kaff“. Nach einem autodidaktischen Anfang begann Roslawez in den 1890er Jahren Musik zu studieren, indem er Klassen in Kursk, der nächstgelegenen größeren Stadt, besuchte, und wurde schließlich am Moskauer Konservatorium akzeptiert, wo er Geige und Komposition bei Sergei Wassilenko und Michail Ippolitow-Iwanow studierte. 1912 schloß er sein Studium ab und erhielt die Große Silbermedaille für seine von Lord Byrons epischer Dichtung inspirierter Kantate Himmel und Erde. Bereits war er neben Alexander Mossolow und Arthur Lourié mit der russischen Künstleravantgarde assoziiert. Er beteiligte sich an den lebhaften, durch Futurismus, Symbolismus und andere neue Ideen angeregten künstlerischen Debatten, und war mit bildnerischen Künstlern wie Kasimir Malewitsch befreundet. 1915 und 1916 wurden einige Stücke von ihm in russischen futuristischen Zeitschriften veröffentlicht—es war die einzige Musik, die in ihnen erschien. Roslawez hieß die Revolutionen von 1917 willkommen und nach der Bolschewiken-Revolution im Oktober wurde er zum Direktor des Konservatoriums von Charkow ernannt. Diese Position hielt er bis 1924 inne, als er nach Moskau zurückkehrte und eine Position im Staatlichen Musikverlag annahm. Roslawez beschrieb sich als „extrem links“ und „intellektuell kreativer Proletarier“ und leitete die politische Abteilung, edierte die Zeitschrift Musykalnaja kultura und war (mit seinem Zeitgenossen und Freund Nikolai Mjaskowski) einer der Führer der Assoziation Zeitgenössischer Musik, der progressivsten der verschiedenen neuen musikalischen Gesellschaften, die in der UdSSR um Aufmerksamkeit wetteiferten. Zu seinen Kollegen zählten Mjaskowski, Mossolow, Popow und Schostakowitsch. Der zehnte Jahrestag der Oktoberrevolution wurde 1927 mit einem Konzert gefeiert, in dem Roslawez’ Kantate Oktober zusammen mit Schostakowitschs Zweiter Symphonie An den Oktober und Mossolows Die Eisengießerei aufgeführt wurde. Aber Roslawez war dennoch ein engagierter Modernist. Die Ausrichtung seiner künstlerischen Sympathien wird in seiner Unterstützung für Aufführungen von Werken der Zweiten Wiener Schule deutlich, sowie durch Artikel, die er schrieb, darunter einem mit dem Titel „Über pseudoproletarische Musik“. Mehrere Jahre lang war er schon von Verfechtern „proletarischer Musik“ angegriffen worden, besonders von der RAPM (Russische Assoziation proletarischer Musiker), die seine Werke als kontrarevolutionär und bürgerliche Kunst um der Kunst willen betrachtete. Der unablässige politische Krieg zehrte an Roslawez. 1929 wurde er als „Volksfeind“ denunziert, und 1930 wurde er gezwungen, für seine früheren künstlerischen Überzeugungen öffentlich Buße zu tun. Er verbrachte einige Jahre als musikalischer Ratgeber des Opern- und Ballett-Theaters in Taschkent in Usbekistan, kehrte 1933 jedoch nach Moskau zurück, wo er am Polytechnischen Institut Vorlesungen hielt und später Dirigenten von Militärkapellen unterrichten musste. Er erwarb sich mit diesen und ähnlichen verhältnismäßig mondänen Tätigkeiten seinen Lebensunterhalt, bis er 1940 endlich in den Komponistenverband zugelassen wurde. Im gleichen Jahr erlitt er einen schweren Schlaganfall und war bis zu seinem Tode von einem zweiten Schlaganfall 1944 Halbinvalide. Anfang der 20er Jahre wurde Roslawez manchmal als der „russische Schönberg“ bezeichnet, aber in einem 1925 veröffentlichten Artikel bemerkte der Kritiker Jewgeni Braudo, dass dies genausowenig hilfreich war wie Schönberg den „deutschen Debussy“ zu nennen. Obwohl seine Musik ultradissonant ist, umfassten Roslawez’ Prinzipien keine Zwölftonformulierungen—es sei denn en passant, wie im späten Skrjabin. In seiner Zeit in Taschkent, nachdem er in Ungnade gefallen war, widmete er sich eine Zeitlang der Arbeit mit Volksmaterial und produzierte neben anderen Werken auch das erste usbekische Ballett, Pachta („Baumwolle“). Die Werke seiner letzten Jahre in Mokau weisen eine Vereinfachung seiner charakteristischen Sprache auf, um ein eher klassisches Konzept der Tonalität zu erlauben, sind aber immer noch individuell in ihrer Ausrichtung, wie zum Beispiel der späte Zyklus der 24 Präludien für Violine und Klavier (1941–42). Unmittelbar nach seinem Tode wurde seine Wohnung von einer Gruppe ehemaliger „proletarischer Musiker“ durchsucht, die viele seiner Manuskripte konfiszierten, obwohl viele andere von seiner Witwe gerettet wurden. Dreißig Jahre lang wurde Roslawez’ Name, der aus den Musiklexika getilgt war, in der sowjetischen Musikliteratur kaum erwähnt, es sei denn abfällig. Sein Name tauchte 1978 wieder in einem sowjetischen Musiklexikon auf, aber Gelehrte, die versuchten, ihm Bedeutung zuzuordnen, wurden noch bis 1982 von der Presse angegriffen. Als Folge der Perestroika, gehörte Roslawez jedoch zu den kreativen Gestalten, die erheblich rehabilitiert wurden. Sein Grab auf dem Wagankowo-Friedhof, das ungekennzeichnet geblieben war, wurde 1990 identifiziert, und viele seiner Kompositionen wurden unterdessen wiederbelebt, veröffentlicht und eingepielt. Die symphonische Dichtung In den Stunden des Neumondes (Russisch: W tschasi novolunja) ist eines der frühesten erhaltenen Werke, und wurde geschrieben (oder zumindest begonnen), als er noch am Moskauer Konservatorium studierte. (Das Werk wurde verschiedentlich zwischen 1910 und 1913 datiert.) Es gibt keine Nachweise, dass es zu einen Lebzeiten je aufgeführt wurde, und es ist wenig darüber bekannt, ausser, was sich aus der Partitur selbst erschließen läßt. Es steht nicht einmal fest, ob der Titel schlicht beschreibend oder ein Zitat ist, aber er ist gewiss für ein Werk angemessen, das sich als ekstatisches, letztendlich jedoch eher unheimliches Nocturne entpuppt. Das Manuskript dieser symphonischen Dichtung verschmachtete jahrelang im Zentralen Staatsarchiv der UdSSR, aber wurde sie von Dr. Marina Lobanova redigiert und zur Aufführung vervollständigt. Es ist für großes Orchester geschrieben und weist eine Anzahl zeitgenössischer Einflüsse auf, hauptsächlich Skrjabin, dessen Poem der Ekstase 1908 uraufgeführt wurde, aber auch von den französischen Impressionisten besonders Debussy und Ravel und vielleicht auch den berauschenden Orchestergeweben von Richard Strauss und Franz Schreker. Wenn die letzteren auch keine direkten Einflüsse waren, so zeigen sie doch zeitgenössische Parallelen auf, und wir sollten außerdem bedenken, dass In den Stunden des Neumondes genau zur gleichen Zeit entstand wie Strawinskys Ballett Der Feuervogel. Die magischen, nächtlich-impressionistischen Aspekte dieses Werks stammen eher von Rimski-Korsakow, von dem sich in Roslawez’ Partitur wenig Spuren finden. In rein russischem Kontext erweist sich Roslawez also als der kosmopolitischere Komponist. Das Werk besitzt eine eindeutig dreiteilige Form, die mit gemächlicher, aber leuchtender Lento-Musik anhebt und schließt. Der anfängliche leise Blechbläserakkord mit zwei reinen Quarten, die durch einen Tritonus getrennt sind, bildet das harmonische Fundament des Werkes. Den säuselnden Streicherfigurationen, tremolierenden Flöten und aufsteigenden Trompetenrufen (Anklänge an das Poem der Ekstase) gesellen sich die schimmernde Harfe und Celesta in einem Klanggewebe von erstaunlicher Delikatesse hinzu, das Roslawez’ sichere Beherrschung eines großen Orchesterklangkörpers aufweist. Ostinatofigurationen steigern sich zu einem stürmischen, aber harmonisch statischen Tutti-Höhepunkt, der sich dann in eine schläfrig-träge, auf die Holzbläser, besonders das Englischhorn konzentrierte Episode auflöst. Diese weicht einem Allegro, das sich bald in ein Presto steigert, das eine scherzohafte Mittelepisode bildet. Dies ist bestimmt ein Tanz (von Elfen, Mondgeistern oder gespenstischeren Gestalten) in lebhaftem 3/8-Takt—die impressionistischste Musik in der ganze Partitur, die besonders an Debussys Ballett Jeux (1912) erinnert, ein Werk, das Roslawez vermutlich nicht kennen konnte. Danach kehrt das Lento-Material des Anfangs zurück, dessen verschiedene Elemente jetzt in ähnlicher, aber leicht veränderter Beziehung zueinander zu hören sind, und wiederum zu einem überwältigenden Höhepunkt anwachsen, der eine intensivere Variation desjenigen im ersten Abschnitt darstellt. Dieser bricht abrupt ab; der leise verhaltene Schluss löst sich in den sanften Blechbläserakkord auf, mit dem das Werk begann. Trotz all seiner pittoresken und freiförmlichen Aspekte besitzt dieses Stück dennoch eine feste strukturelle Basis, und viele Werke in Roslawez’ Œuvre beschäftigen sich mit seiner persönlichen Behandlung verschiedener auf dem Sonatensatz basierender Genres. Neben Streichquartetten, Klaviertrios, Violinsonaten und so weiter versuchte sich Roslawez auch mehrfach am größten aller Genres im Sonatenstil: der Symphonie. Anscheinend gab es eine frühe Symphonie von 1910 und 1921–22 wurden zwei weitere skizziert, aber nicht vollendet. 1926 begann er mit der Komposition einer Kammersymphonie, gab dieses Projekt (das in zwei Sätzen geplant gewesen zu sein scheint) jedoch auf und hinterließ einen Einzelsatz in Particell und ohne Coda. Dieses hochinteressante Fragment wurde von dem Komponisten Alexander Raskatow vervollständigt und (für ein Ensemble von achtzehn Spielern) orchestriert; es wurde in den 1990er Jahren als „die Kammersymphonie von Roslawez“ aufgeführt und aufgenommen. Es war jedoch nur die Realisierung eines faszinierenden, unvollendeten Torsos.